The Ceramic Shop carries all bricks for the repair of your L&L kiln -- bricks are sold individually or by the section. L&L kilns are known for their hard element holders; when you repair a section of your L&L kiln, you may find that your old holder is totally fine and can seemingly be re-used. Well, you're certainly right about that! For ALL L&L bricks, you have option to purchase replacement parts either with or without the hard element holders -- which can save you money. Simply find the brick you need by kiln type, and select with or without element holders from the drop-down menu that is on each product page. If you plan to re-use your hard element holders, simply slide them out of the damaged brick once you remove it from your kiln. When you recieve your new L&L brick or brick section, just slide the old holders into the pre-cut grooves -- it's easy because the bricks have been designed for economical re-use of parts, which is just one more feature that makes L&L great! Order the correct firebrick precut and rerouted from The Ceramic Shop. If you are not sure what brick to purchase for repairing your kiln, we are happy to help you -- just give us a call. Remove the elements from your kiln if you have not already done so. When you do this, please keep in mind that in some kilns, the placement of elements DOES matter, so label the location of your elements when you take them out of your kiln (for example, 'top', 'bottom', 'center', etc.). Remove the section of the kiln that needs to be repairs and place the whole thing on a flat surface. Please note that it is very important to maintain the proper alignment of your kiln bricks, so setting up on a very flat surface is very important. Next, you will have to remove the damaged brick or section from your kiln. Do this by first loosening the clamps on your kiln''s stainless steel band just enough to remove the damaged brick. DO NOT completely remove the stainless steel case; you want to loosen those clamps just enough to allow the damaged brick to slide out with slight hand pressure, while the other bricks stay in place. If you plan to recycle your hard element holders and place them in the grooves in your replacement brick, slide them out of the damaged brick and slide them into your new brick. Slide the bad brick(s) out of the kiln section and put in the new brick(s). Make sure that the element holders line up with the holders on either side. Note that there is a top and bottom in the element holder, so be sure to get the orientation correct. Re-tighten the clamps on the stainless steel casing. Alternately tighted the bottom and top clamp so that the casing doesn't get cocked. Sand off the top surface of the firebrick to match the surface of the other firebrick. Sandpaper will work just fine for this task. Not comfortable doing these repairs yourself? If you are located within 2 hours of the Philadelphia area, we can fix your kiln for you! Call us today for a quote. First, locate the nameplate on your kiln. This will have all of the information you need, including the kiln model and serial numbers, voltage and phase and the year the kiln was manufactured. 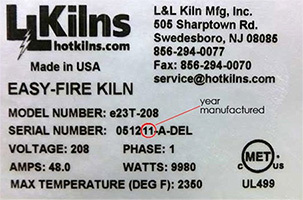 Usually the last 2 digits of the serial number indicate the year in which the kiln was made. E18 3" Sidebrick, no el. hold. L&L 18R Series Sidebrick Sect.